What is the difference between click systems and Tongue and Groove for parquet floors? "mafi natural wood floors have a high-quality, strong tongue and groove connection for the perfect fit." In contrast to the tongue and groove method, the click system is different as it was designed for the DIY market and provides for a fast installation variant. However, this variant is behind in both terms of quality and sound dampening when compared to the tongue and groove plank. mafi planks should be installed by professional floor layers. 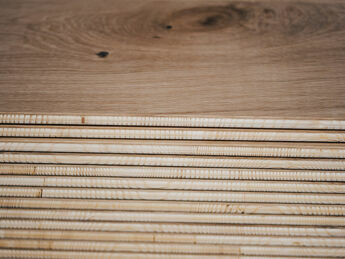 The planks have tongue and groove on all sides for continuous installation. A special tapping block and a minimum of a one kilogram hammer are the tools required. Tapping is always done on the groove and never on the top layer. The mafi connection type is very stable and allows for flexibility in the type of installation from floating, to partial surface and on to full surface installations.